On occasion, I get nostalgia as I remember places I have lived in. It usually happens while I eat. Food seems to have such evocative power… This morning for example, as the weather has become hot, my tummy took me to the heart of Dixie and I suddenly wished I could add some grits on my fried eggs…corn bread, black-eyed peas, okra, hush puppies and then a peach cobbler suddenly poured into my culinary memory. I’ve had a similar experience while eating lobster, or shrimp when it is cloudy and chilly: I would wish for clam chowder and think of the Connecticut coast. The quaint towns of Mystic, Groton, Noank and their scenes I have painted à plein air, bring in their visual memories, but the food, oh, the food! It makes for another dimension in remembering. There was this tiny restaurant called Kitchen Little; so good, yet so small, often there were more people waiting to get in than people sitting inside. Then of course, were I in New England, wishing for some sunshine, I would possibly crave Pico de Gallo sauce and black refried beans, which would soon take me back to Malinalco and the days when Luli and I rented a small apartment, directly across from the Augustine Convent. The amazing mural in its corridors comes to my mind along with the flavors of memelas, nopales, cecina, fried onions and the smells of hickory wood burning in the clay ovens; and what could I do but follow on, down that road to Valle de Bravo, with its cold waters and surrounding Alpine mountains. Nowhere else would tostadas con carne and hot tortilla soup taste as delicious after a chilly day of sailing. My three boys and I would shiver in our wet clothes while we stared, smiled and passed saliva, staring at our food being cooked. For a few weeks each year, we lived in Old Acapulco, on the north side of the Bay. Painting commissions took me there. I did a couple of murals, and while in the area, I had a chance to revisit some of my childhood favorites: the Flamingos hotel near La Quebrada, where Johnny Weissmüller (Tarzan) had a suite on top of a cliff, surrounded by the crashing waves. As dictated by tradition, each Thursday this hotel’s restaurant still offers one of the best pozole dishes I ever tasted, along with a breathtaking panoramic view of the bluest ocean. One shot of free Mezcal and off you go, dancing Danzón and Salsa into the sunset. The tradition set in so deep, my wife and I have continued serving pozole even now at our Estudio-Café restaurant in Nuevo Vallarta, on Thursdays. (Estudio-Café will be open for high season in October 2010). 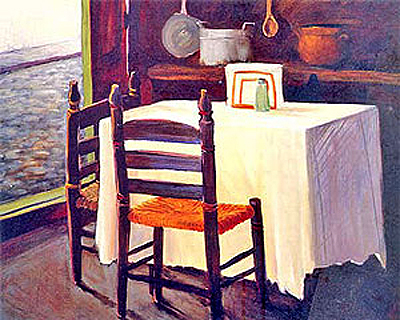 Favorite places I have lived in are usually places that offer good scenes for painting, good food and good company. Many a small town USA or Mexican pueblos have retained my easel… I just could not help staying on, meeting the people, painting their ways, living their customs, and of course, eating their food. Famous Spanish painter Dalí once said cooking and painting are sister arts; this is certainly so. Colors are flavors, and personal style permeates both canvas and recipes, forming each people’s culture. I cannot recall staying long in any town where there wasn’t a very good little restaurant, one usually worked by the owner personally. So many towns and so many paintings, and so many little restaurants I grew fond of, where I made friends with the proprietors. Occasionally, I get nostalgic for a particular one I may long to return to. I wonder how they are doing and what they might be serving today. The aromas evoke the scenes, I close my eyes and my nose and palate take me there, in almost no time.